Stands of fresh produce are intentionally seen first when entering My Fresh Basket. For many, the debut couldn't come fast enough. And every day since opening its doors at the end of June, the parking lot of My Fresh Basket, the new, locally owned grocery store downtown just north of the Spokane River, has been full for most of the day, in addition to foot and bike traffic. On weekdays, lunch crowds fill the tables of two outdoor patios, one at the store's main entrance, another on a second-floor deck above. Inside, shoppers with reusable tote bags on their arms pick from colorful displays of fresh produce, much of which is sourced from regional growers. An espresso machine whirs at a coffee bar near the entrance that's exclusively serving organic, fair-trade beans from Spokane's Roast House Coffee. Smiling employees — My Fresh Basket employs about 100 people; including several teens in their first job — in bright-green T-shirts stock shelves and ring up customers at the checkout. While a majority of goods on the shelves and in coolers around the store fall into one or more categories of local, organic or specialty items, My Fresh Basket store manager Matt Grittner says there's something for everyone. "It's not just for the people of Kendall Yards," he affirms. Grittner says the store emphasized stocking items competitively priced for all demographics, including residents of West Central and other nearby neighborhoods. About 30 percent of the store's inventory is considered conventional grocery store goods (pantry staples and generic or mainstream brands), with the remaining 70 percent specialty items. My Fresh Basket was recently approved to accept food assistance cards (EBT, or Electronics Benefit Transfer), and is waiting on approval from the state's Women, Infants and Children nutrition program (WIC). At the same time, the store's overall mission is to serve as a convenient day market, with fresh ingredients that shoppers can purchase and prepare the same day. Preliminary market research by My Fresh Basket stakeholders showed that people now shop more frequently for food, which heavily influenced the store's decision to largely focus on fresh produce, meats, baked goods and other products. 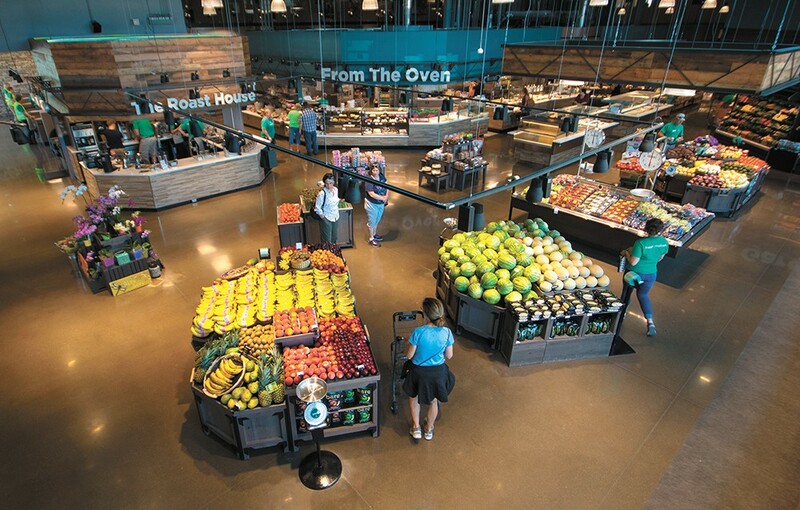 My Fresh Basket's layout, with the produce, deli, bakery and bistro departments in view as soon as customers step inside, was also intentionally designed with this trend in mind. "People are on the go more often, and tend to shop for freshness more often, rather than once or twice a week," Grittner says. He adds that My Fresh Basket's department managers — many of whom previously worked at other Spokane-area grocers, and bring years of experience — have more autonomy to make decisions that cater to customers' needs and requests. Customers are also welcomed to leave their feedback on items or brands they'd like to see stocked there. My Fresh Basket’s growler station offers local beer, cider, kombucha and craft soda. Like its local contemporaries (Main Market Co-op, Huckleberry's), My Fresh Basket offers a variety of prepared food that can be enjoyed to go or on site, including three daily rotating soups from a hot bar and cold salad bar ($9 per pound). Among its many freshly prepared sandwiches, salads and other dishes, the bistro serves an already popular prime rib sandwich, with Gruyère cheese, caramelized onions and horseradish cream cheese. Breakfast at the hot bar is served at 6 am each day ($7 per pound); for midday meals, the hot bar and salad bar are both typically open from 11 am until about 8:30 pm. My Fresh Basket's bakery department not only serves housemade pastries, cookies, donuts and other treats, but also has items from other local producers, including Petit Chat, Common Crumb, Chaps and Morning Sun bakeries, and Just American Desserts. 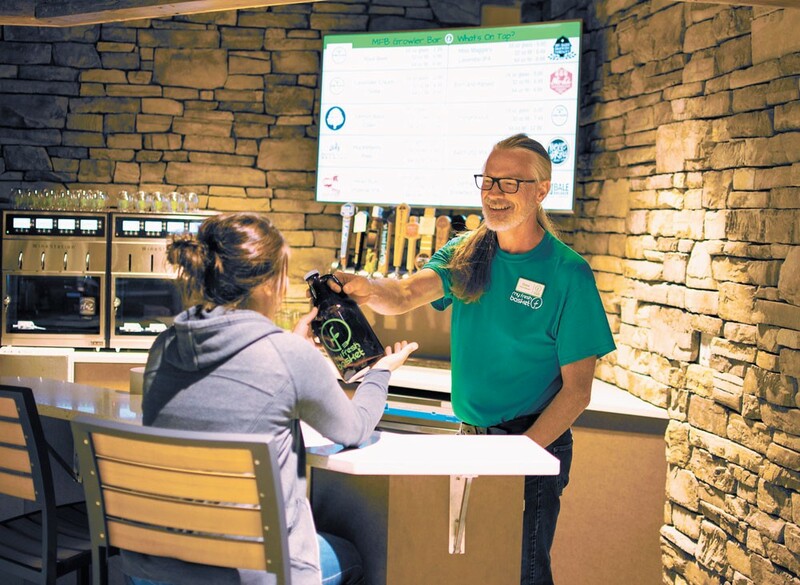 In the northwest corner of the store, a growler station offers local beer and cider on tap, along with kombucha from Bare Culture of Coeur d'Alene. As of its opening, My Fresh Basket also had two nonalcoholic craft sodas from Orlison Brewing Co. on tap. Soon, customers will be able to enjoy a glass of wine, beer or cider on its two patios (the store is waiting on approval for its liquor license). While My Fresh Basket's 25,000 square feet of retail space has been open daily since June 29, features to come include an event and classroom space on the second floor, where customers can sign up to take healthy cooking classes or host private events. My Fresh Basket event specialist Hailey Hyde plans to offer sessions on health and wellness, beer, wine and coffee tasting, cooking classes focusing on dietary restrictions, kids' classes, guided painting and floral arrangement workshops, and more. "We'll be partnering with outside experts, and constantly changing and offering new events," Hyde says. More details about My Fresh Basket's special events will come later this month; the store's official grand opening celebration is Friday, July 21. Hyde expects to begin hosting events sometime in August, and says that customers will be able to sign up and pay for sessions online. "People are impressed so far, with the layout and the patios," Hyde says. Available for iOS and Android, the store's custom, free mobile app is the home of its in-store program, Fresh Rewards. For every $5 spent, customers earn 6 cents back in "Basket Bucks" to spend in-store, which can be redeemed at any time and on any purchase. The app also features coupons, recipes and a shopping list. Upon signing up, users can get a one-time $5 credit to their account.